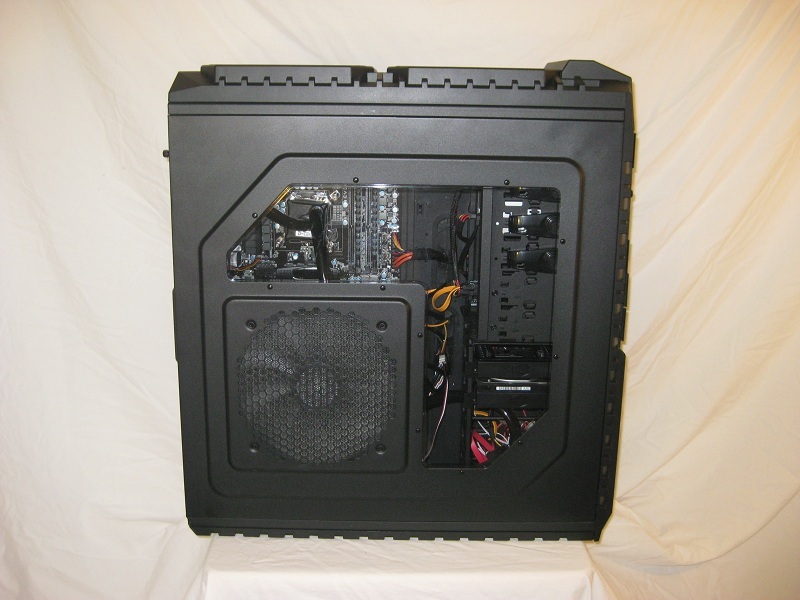 Cooler Master is a well known company providing anything from case fans, power supplies, CPU heatsinks, and of course, cases. 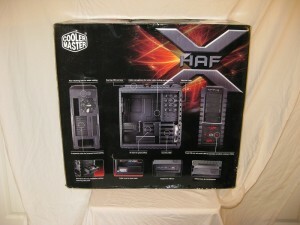 Today we will be looking at their flagship case named the HAF-X. 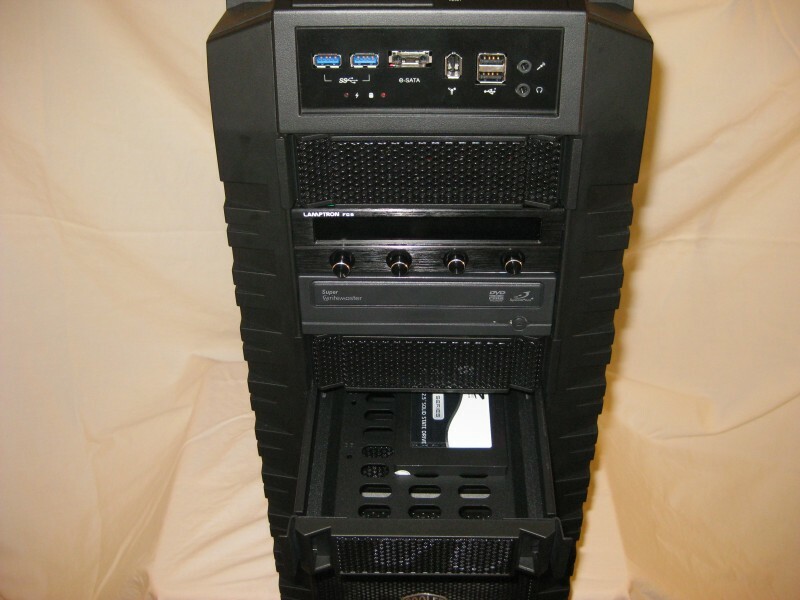 It is a full tower case offering plenty of cooling options (HAF = High Air Flow) for both air and water cooled setups, USB3 ports on the front accessory panel, room for an XL-ATX standard motherboard, and plenty of cutouts with grommets for cable management that will be touched on later. There is no doubt this is a full tower case. 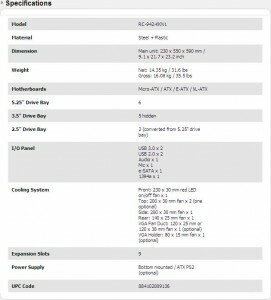 Measuring in at 9.1 x 21.7 x 23.2 inches, it is right up there with the likes of the (barely larger) Corsair Obsidian 800D. The styling out of the box hit me quite favorably. I don’t like a lot of “bling” or funky lines, and this case doesn’t have much of it aside from a red LED front fan which can be turned on/off with a switch easily accessible on the front accessory panel. That same panel holds two USB3 ports, two USB2 ports, ESATA, audio, microphone, and a 1394a FireWire port. The power and HDD activity lights are red. It has a large plexiglass side window to show off your internals. The paint inside the case is a nice matte black finish. Being from the HAF line, one would expect superior airflow especially with its included 230 mm front red LED intake, 200 mm side intake, top 200 mm exhaust, and 140 mm rear exhaust; and it delivers. 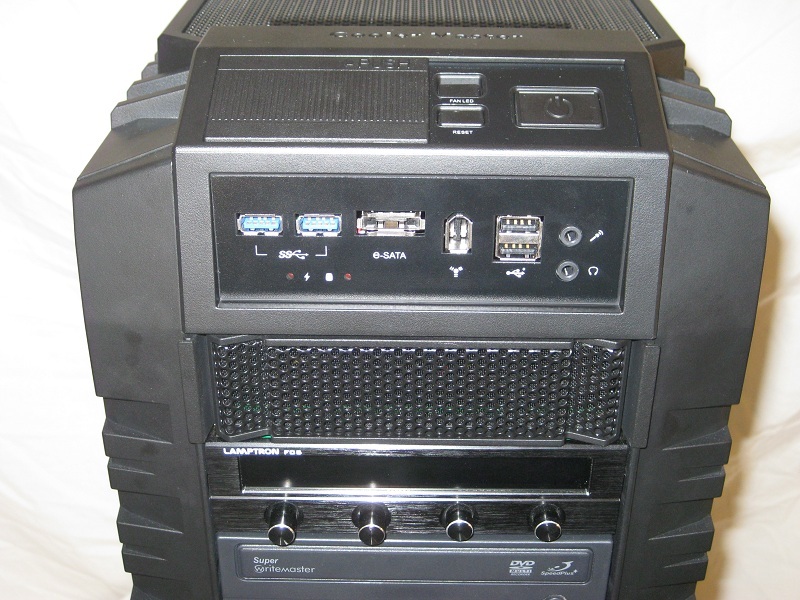 It also comes with a couple of air ducts to direct the flow inside the case to cool warmer components like a GPU. 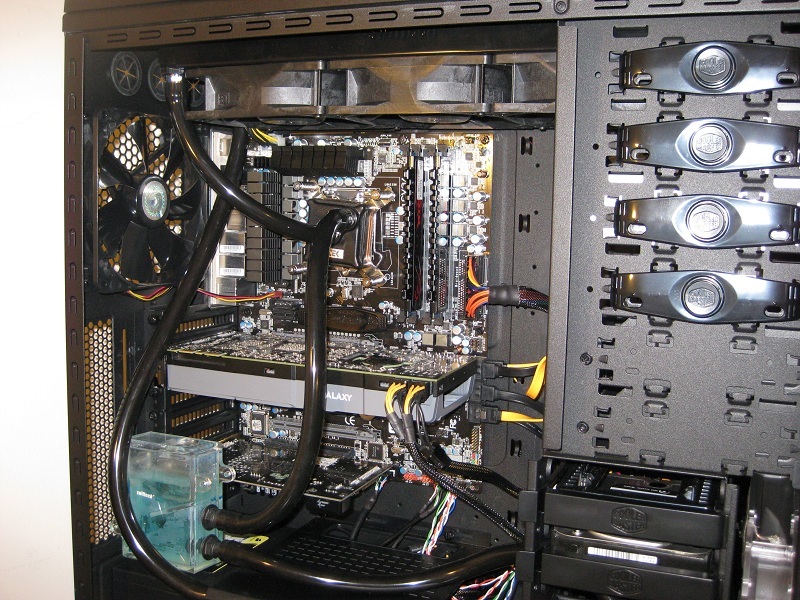 One duct sits behind hard drive cages moving air towards the GPU, and the other is on the side fan angling towards the GPU and motherboard. 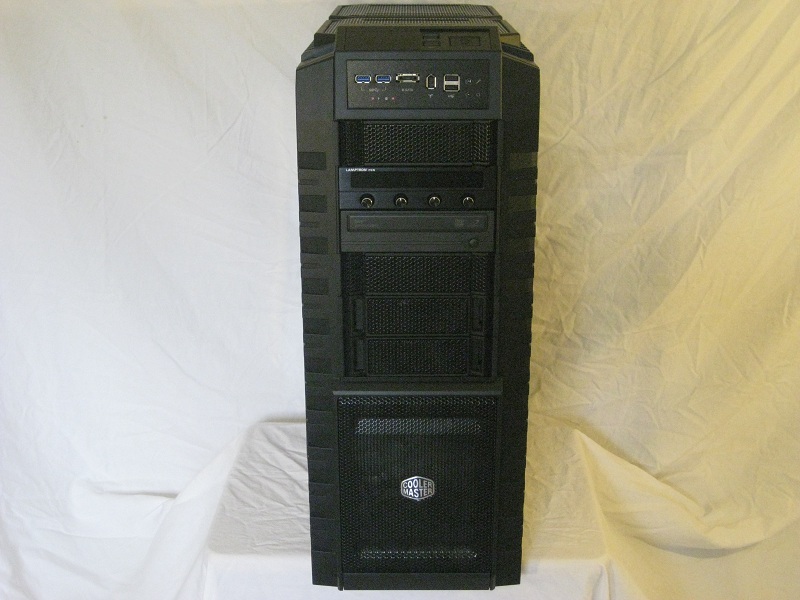 Combined with the rear and top fans, this creates optimal airflow in the case. It dropped my case temps about 2-3 °C and my idle GPU temps about 4 °C for the warm-running GTX470 when compared to the 800D. Load temps of both my CPU and GPU dropped about 3 °C as well since it’s getting cooler air through the radiator and GPU (note ambient temperature was within 1 °C between all measurements listed above). Installation was straight-forward for the overwhelming majority of parts. There were plenty of accessory screws and the like to go around, as well as plenty of room internally for everything to have its own place including the Swiftech MCR320 (3×120 mm) radiator up top. Though, with that radiator I ran into a quandary. Do I mount the radiator ABOVE the frame, remove the 200 mm fan and mount the Panaflos below it, or do I mount it below the frame and add the Panaflos? The first option didn’t yield much space up top for the wires on the back of the accessory panel, but it did fit with a little elbow grease. 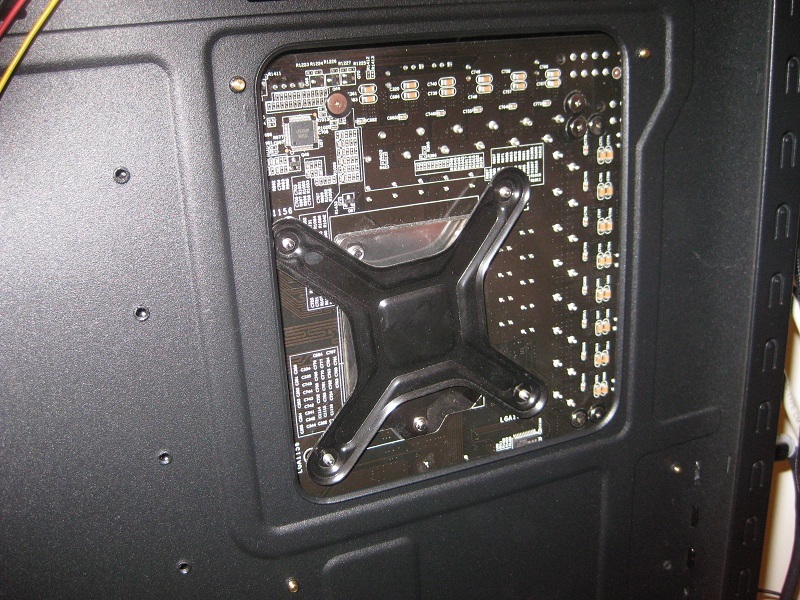 I then noticed that the mounting for the fans would not be flush. This can be resolved by putting some foam around the fan and tightening down so no big deal. This method, though I don’t think the way Cooler Master intended, allows for a bit more room up top inside the case and will reclaim a 5.25″ bay just in case you need it. I decided to mount it below the frame instead. I did lose a 5.25″ bay, but seeing as how there are four available if you are using the 2.5″ bays like I am (six otherwise), this wasn’t an issue for me with a single optical and fan controller. 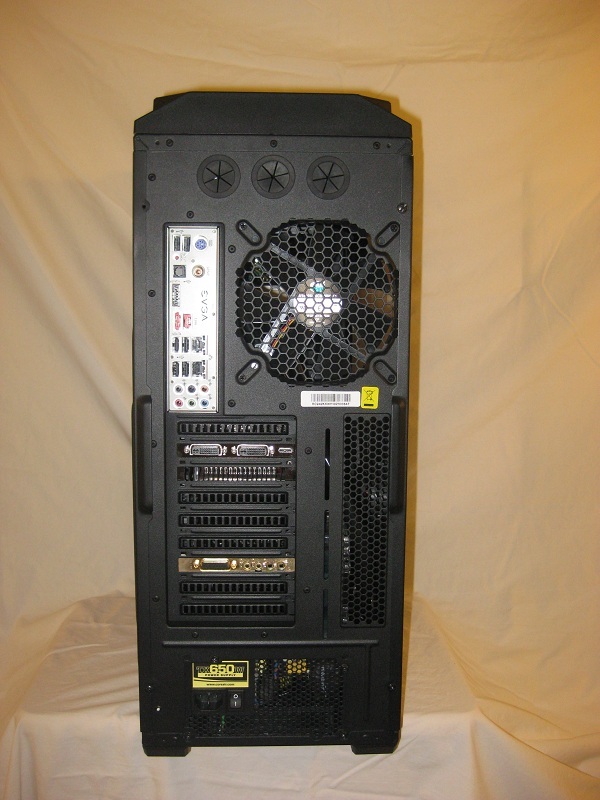 Also note, this case will fit a double depth radiator such as the Thermochill PA 120.3, but you will have to remove the 200mm fan(s) up top and mount the fans in a pull configuration otherwise the fans would likely cover too much of the motherboard and cover the 8 pin CPU power header. The good part about mounting below the frame is that you keep the 200 mm top fan to aid the radiator in exhausting out of the case and still have enough room for 120x38mm high speed fans pushing from below. 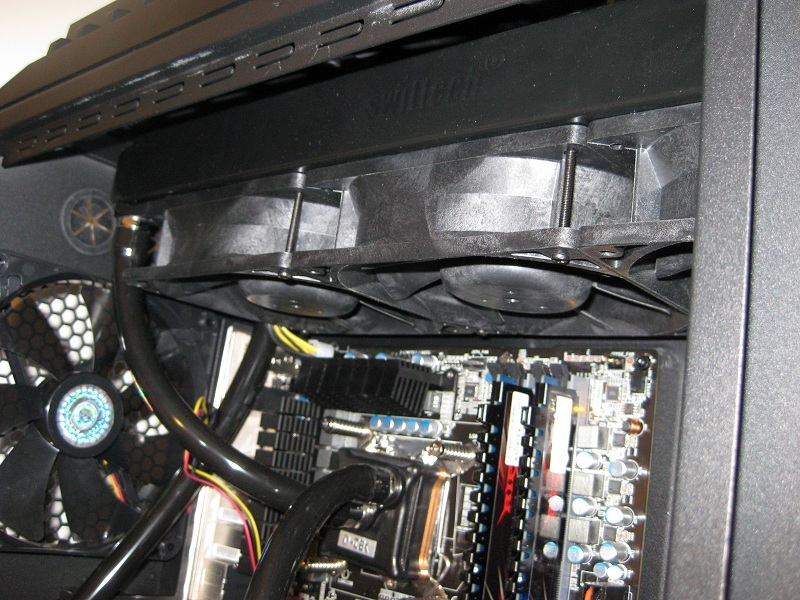 The not-so-good part is that if you don’t have another 200 mm fan, there is a decent sized gap between the top side of the radiator and the top panel of the case, preventing that slightly warmer air from exiting directly out of the case as quickly as it would with a fan on top. That is nitpicking however and I cant imagine it would affect temperatures more than negligibly. This case also has two hot swappable hard drive bays, a very nice feature. 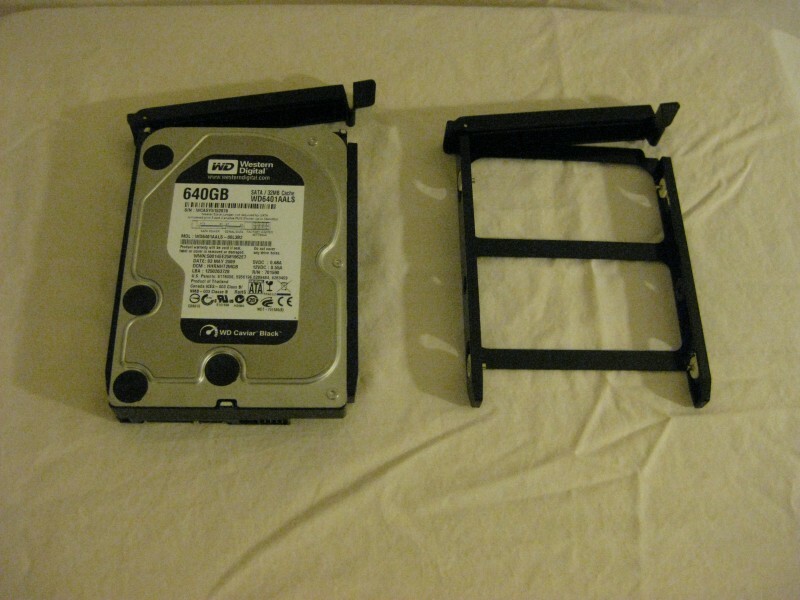 You can securely mount a 3.5″ or 2.5″ HDD (think SSD these days) to these trays as well. The other 5.25″ bays have a tool-less feature that locks any items in place with the click of a button. The other HDD trays slide in from the side of the case. I ended up removing three of them for easy placement of my pump which still left room for my Raptor and Caviar Black drives. 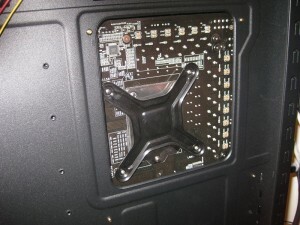 Along with the air duct for the GPU, Cooler Master has included an “advanced GPU holder to reinforce heavy GPU cards.” While my card certainly didn’t need it in its stock form, it will most certainly require it with the EK470 GPU block on it. 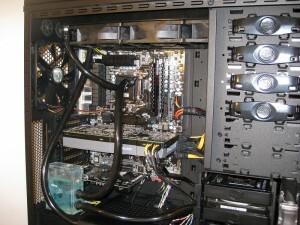 It mounts securely to the back of the case and holds it up about in the middle of my GTX 470. With it being adjustable, any other card will be supported by this item as well. There is no sag on the card while using this tool and it appears you can use this with two cards as well. Another great value-add for this case was the inclusion of a power supply cable partition. 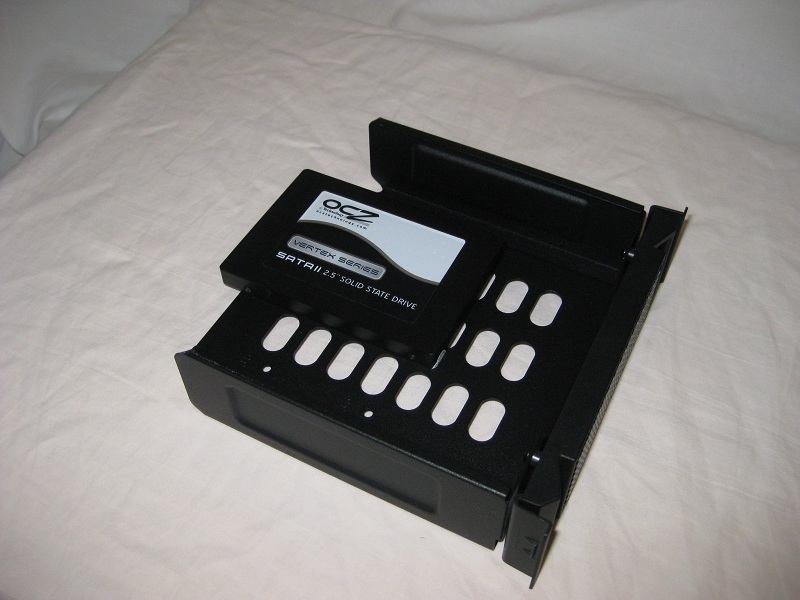 This nifty little item sits on an adjustable track on the bottom of the case (is removable) and covers up any unsightly leftover wires, which keeps the case very clean looking when proper wire management is done. Also note the motherboard tray has a nice sized cutout for easy removal and installing of any CPU heat sinks with back plates. I really have to admit I wasn’t jumping for joy after I remembered what a bear it can be sometimes to swap all your stuff out into another case. 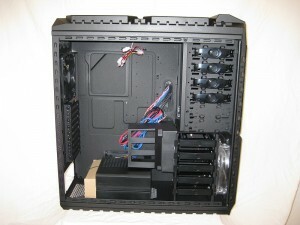 Now, my problem is which case do I use, the 800D and Cooler Master HAF-X? What a terrible decision to have to make, right? A true toss up if you ask me as both cases certainly have good arguments for their use. 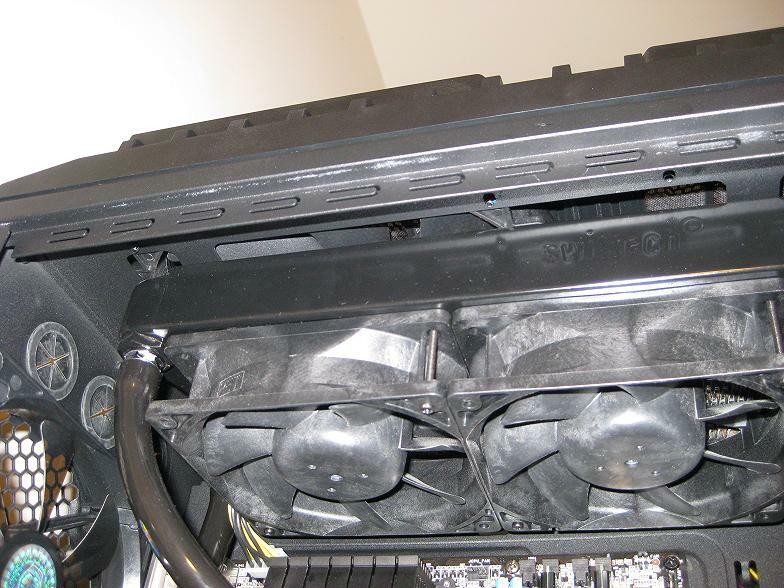 This case uses dust filters, however they are on the exhaust as well. Personally I would remove those to allow more air to escape the case, but this is hardly a problem if left in place. Another great feature is that one can easily remove the front cover for the 230 mm intake fan and pop off the metal mesh in order to get at the dust filter. I did run into one concern, however it could be from a bit of carelessness on my end. The protrusion/plastic part which keeps the top part of the case on snug managed to break off in a matter of minutes and I really was not torquing on the piece at all. In its broken form, it will still stay nice and tight with no pressure on it, no problems; but if you decide to mount the radiator above the frame and it breaks, it wont hold with any pressure against it and will appear lopsided. So long as the tabs are not broken, this wouldn’t be an issue, so just be careful. I really like the addition of the front panel USB3 ports as well as ESATA (something the 800D which costs ~50% more does not have). 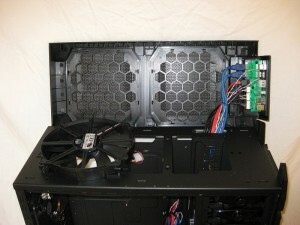 The large fans keep the air moving through the case and keep all your components cool and do so quietly. The noisiest fans on the case were the Panaflos by far. 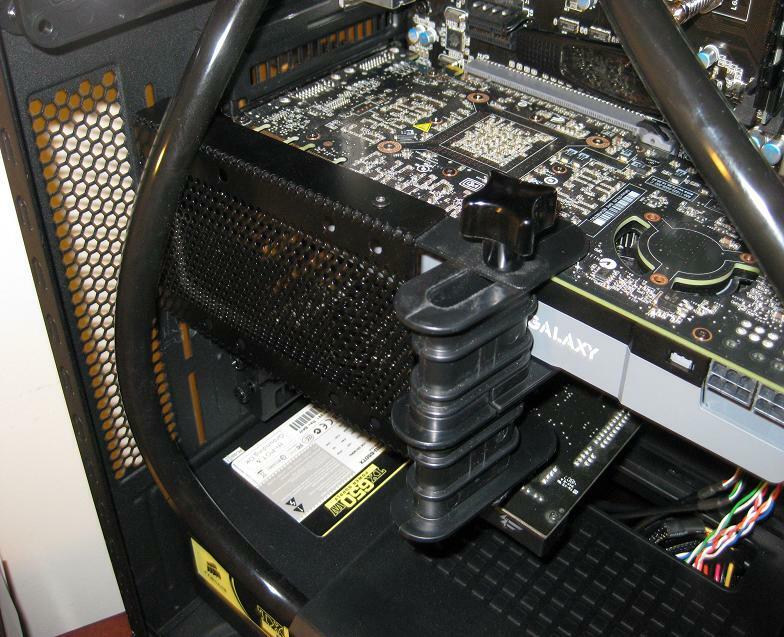 The adjustable GPU support is another great value-add for heavy GPUs or one with an aftermarket cooler/block on it keep it level and secure. Having a 2 1/2 year old in the house, the power button protection feature (a panel that slides left and right covering the switches) was also nice to have so those sticky little hands can’t easily power down the system in the middle of capturing a flag in Battlefield: Bad Company 2 (yes, that happened, in a match no less!). Fitting all of my components was never an issue. Cable management was easy and effective due to the gratuitous use of the cable management holes with grommets and included zip ties. So, as nice as the exterior looks, the interior can look just as clean with a little bit of effort (and no dremel needed). Overall, the case has certainly done its job well with some great features and what I would call value-adds at its price point. 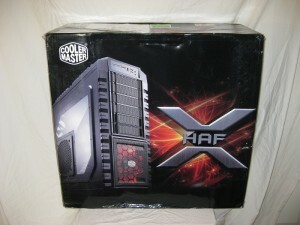 The Cooler Master HAF-X can be found at newegg.com for $199. 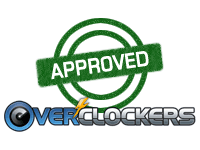 A special thanks goes out to Cooler Master for providing Overclockers.com with the review sample. Where did you mount your pump? PUmp was in the HDD bays on the bottom, taking 3 of them out but still having 2 available + the two that are hot swappable. Definitely a bang-up job. Nice work! Great case. I just upgraded from the HAF to the HAF-X. A slight drop in temps, on my 470GTX. I really like the looks of it over the HAF. Nice Case Review EarthDog , I Like the HAF-X look very roomy! It is a roomy case, no doubt. At its price point there are a lot of great features on this unit, thats for sure. So how do you guys accquire these items for reviews? Surely you don't buy em, do you? One of the editors can likely answer that better but its more or less just about relationship building with the companies, and having a forum with a lot of visibility for exposure to their products. I have bought some stuff on my own, but I cant say that is was SPECIFICALLY for review. 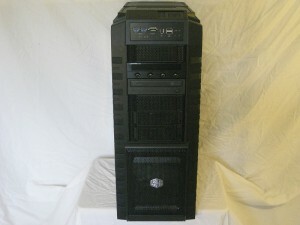 It was a want/need and I put up a review on it (like my Obsidian 800d review and the 470 review for example). 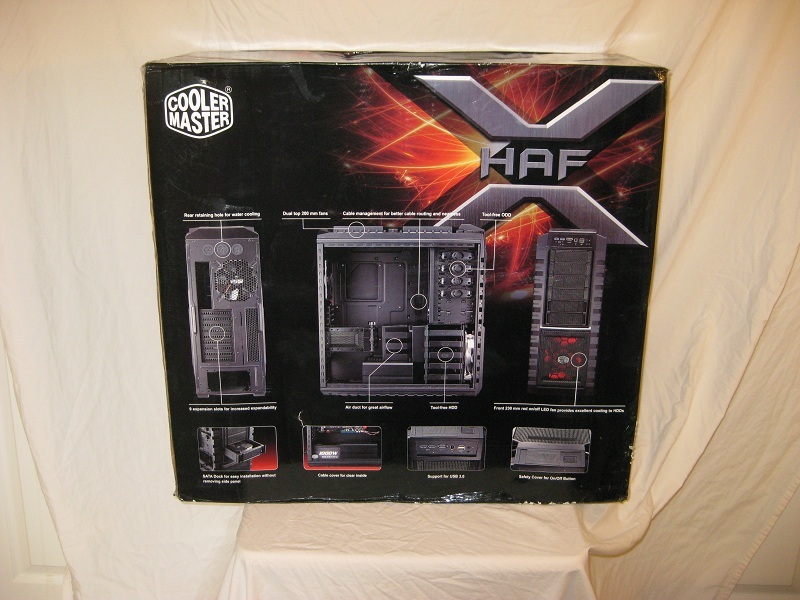 the HAF X is an awesome case, i love mine, the only other case i would suggest soemone take a look at if they are thinking about getting the HAF X is the coolermaster 800D. 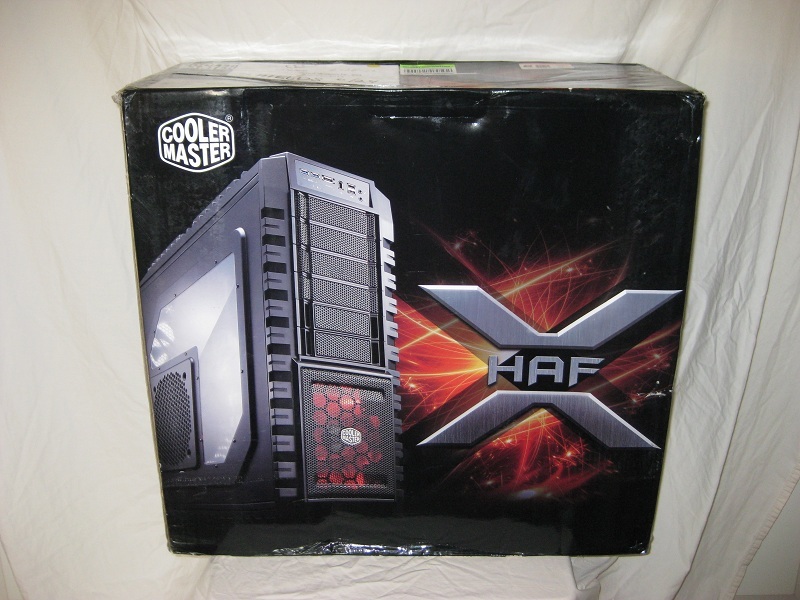 i ulitmatly went with the HAF X because of the price difference. But yeah $200 vs $289, the 800D while built a little better (feels more solid, hot swap cages slide better for example) doesnt have much more to offer. 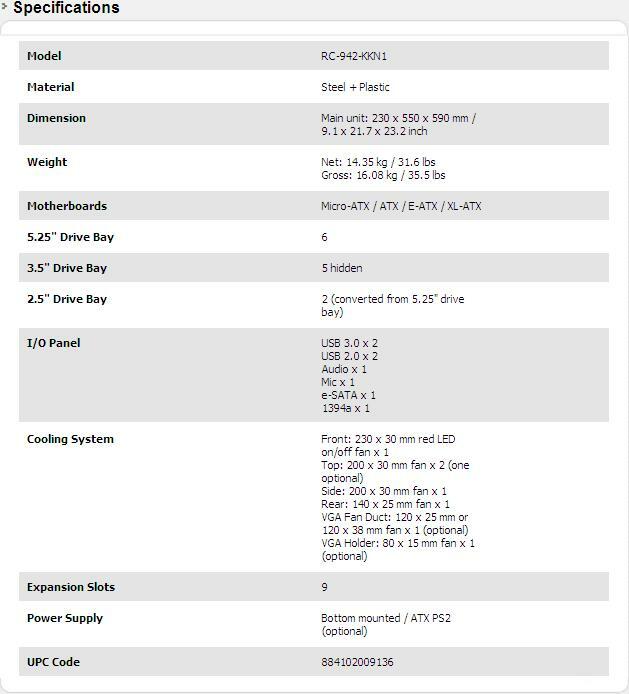 The people that say there no USB3 benchmarks, Look at the new NEC uPD720200 on Asus and Gigabyte Motherboards(MB). I have a Gigabyte GA-890FXA-UD5 and it has the pin header right on MB for two USB3 connection. 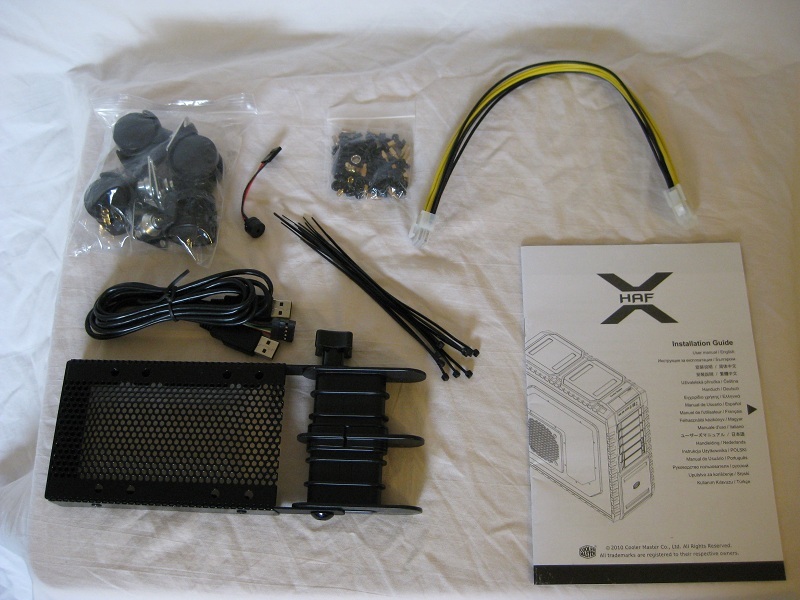 When I contacted Coolermaster about HAF X lose 3 feet of USB3 in the case, they tell you there is no standards yet. That's dumb. Hey, there are now Mb that have it, MSI, Asus, Gigabyte, and the rest. Agreed, I have the HAF 932 with the Biostar mb and when I went to mount the Noctua D-14 I had to remove the board just to put the back plate in. 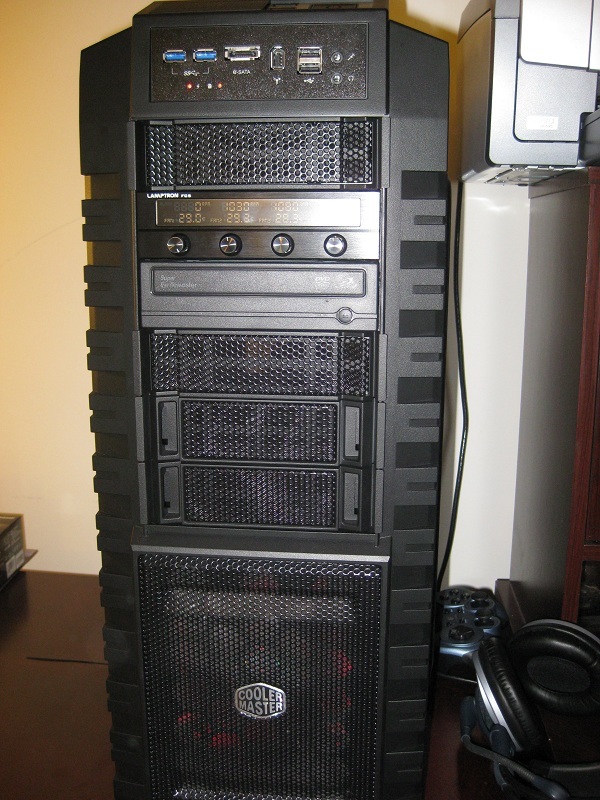 The wife has the Antec 1200 and is running a Asus P6X58D Prem. board and it barely let me put the back plate in when I put a D-14 on hers also. You don't suppose it would possible to fit a 140mmx3 radiator in there? Im wondering the same thing^^^ ive searched everywhere to find someone thats top mounted the thermochill pa140.3 but no luck.im not sure if the rad will mount along with the fans or not. hopefully someone will respond before i have to order a rad next week. 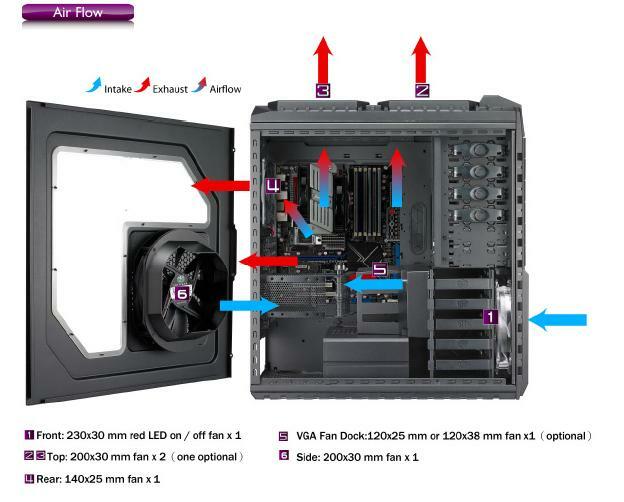 im also wondering if anyone knows where to get a blue led 230mm fan to replace the front fan? im also wondering if anyone knows where to get a blue led 230mm fan to replace the front fan?